All the power of granular synthesis in this simple-to-use unit. Granulator makes it a snap to create wild and wacky cartoon voices, bizarre sounds and loads of other weird effects. The only digital phaser with up to 16 stages, letting you create incredibly authentic analog-sounding effects. The ultimate plug-in for vintage sound lovers. You get the whole nine yards - plus one - with these ten stunning filters which give you total control on each parameter. 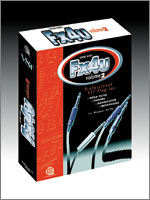 FX4U 2.0 Vol. 2 is for PC only. Like all our plug-ins, it has been successfully tested with Steinberg Cubase VST, Cubasis VST, Nuendo and WaveLab 3.0, E-magic Logic (all versions), Sound Burst VST Processor, Sonic Syndicate Orion, STL VAZ, Image-Line Fruity Loops and FASoft N-TRack Studio.